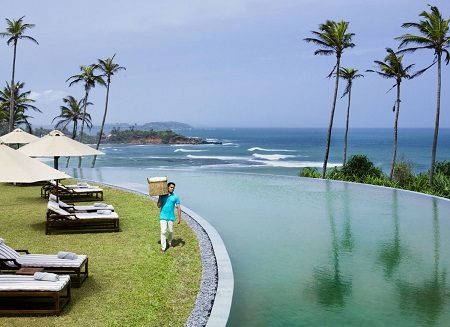 Cape Weligama is Sri Lanka's newest luxury resort, 30 minutes east of Galle on the southern coast. 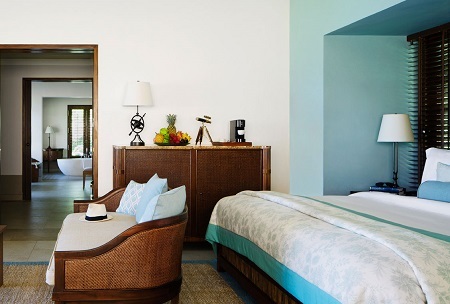 It is home to a gorgeous collection of 40 free-standing villas and suites. The hotel enjoys elevated cliff top views, 12-acres of landscaped grounds and boasts a spectacular 60m crescent-shaped infinity swimming pool. 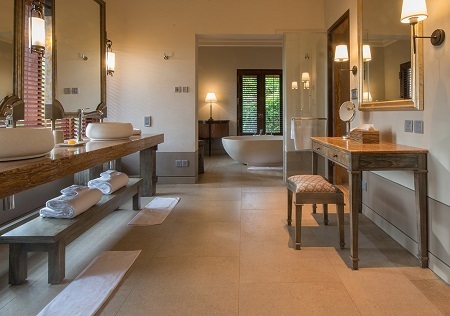 The 40 suites occupy individual pavilions, traditional in style on the outside with terracotta-tiled rooftops and Wattas (stone walled gardens), yet contemporary inside with lavish luxuries and every conceivable mod con. The rooms measure between 130 and 300 square meters. 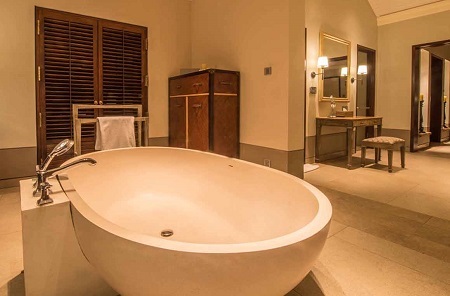 Each comes with private butler services and bespoke dining and spa facilities. The room types are separated into two groups. 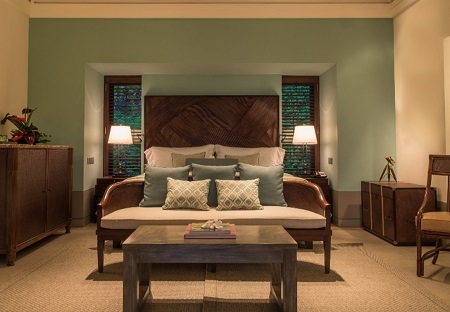 The 'Villas' are designed with families in mind and are made up of interconnecting Master Suites. The cluster of Villas have direct access to the resort's Cove Pool (fun pool). The second group are called the 'Residences' with 1 and 2 bedroom options available. Each cluster of 3 Residences share access to a private 15m infinity pool, as well as access to the main moon shaped swimming pool. The hotel offers a choice of dining options making the most of fresh local produce. The chefs encourage direct conversation with guests, rather than relying on formal menus. 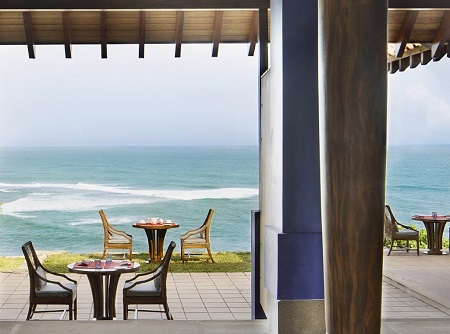 The three main restaurants offer distinct experiences and in-suites dining is also encouraged. Pluck your pick of the day's fresh catch from the display in the Pola (seafood market) and let the chef know exactly how you'd like it cooked. Char-grilled blue swimmer crab perhaps with a zesty tamarind sauce? Or maybe you'd prefer a lobster bisque, a goat cheese and pine nut tortellini or a rack of lamb for two? Finish off with a butterscotch cheesecake or creamy tiramisu. Alternatively try eating with your hands, Sri Lanka style, at the alfresco Kumbuk, where daily spreads showcase the island's deliciously unique cuisine. Finally Misaki, is a authentic cliff edge Japanese teppanyaki restaurant. The Pool Bar is also worth a mention as it serves finger food, cakes and refreshments throughout the day. Then the Cliff Bar hidden away under the Moon Pool hosts movie nights with popcorn and shows international sports fixtures with special themed snacks and drinks. Also under the pool is a fully equipped air-conditioned gym. shing, seasonal whale and dolphin-watching trips and banana boating. 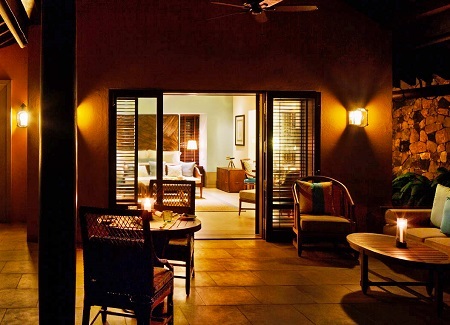 For those looking for something less active however, all suites have dedicated spa facilities for pampering 'at home'. Cape Weligama's signature spa rituals are tailored to each individual and replenishing facials use only the highest quality products. Try the Ceylon Tea Experience for a calming 90-minutes of massages, poultices and steam to relieve tension, restore harmony and rebalance vital energies. Or opt for the Ceylon Spices Experience, which uses either cinnamon oil - an aid to slow circulation, sore muscles, joint pain and stress. 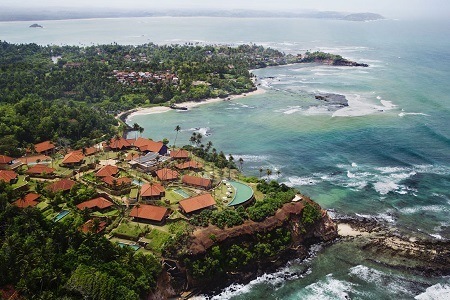 For trips further afield, resort guides are on hand to whisk you off in private vehicles stocked with snacks and refreshments to see sights such as Mirissa's boat-laden harbour, Matara's pair of crumbling forts and the historic former old town of Galle whose evocative cobbled streets encased in coral and granite walls exhibit striking ochre-coloured buildings, museums and bijou boutiques. The national parks of Yala and Uda Walawe, home to elephants, leopards, bears and rare birds, are easily accessible options for day trips.